$600 or for as low as FREE*! Past activities included: counter terrorism training, hiking, hand gun and rifle training, ATVs in the desert, paintball war, basketball tournaments, and more. Our program is based in Jerusalem’s historic Old City. Cities visited on past programs include Tel Aviv, Hebron, Tzfat, Sderot, Tiberias, and more. Past participation on Israel programs (birthright, bbyo, March of the living, etc.) does NOT disqualify you from this amazing trip. *This trip is highly subsidized and can be free for qualified undergraduates. Every applicant will have a discussion with the trip leaders about their situation and a reasonable cost for the trip will be determined. Non matriculating or graduates can apply and will be charged starting at $600. Nobody will be turned away because of financial difficulties. A $150 deposit must be submitted to hold flights once booked. That deposit becomes non refundable after December 1. Brothers accepted will be expected to arrange transportation to our airports of departure. Fees associated with reaching the airport are not covered by the program costs. However, our office is available to help with flight bookings to reach the flight hubs. Once accepted to the program this process will be thoroughly explained. Flights can be extended, up front. Those wishing to stay in Israel beyond the program dates will be responsible to pay for the difference of the standard ticket and the additional charges related to the extensions. Flight extensions must be arranged well in advance. ​Deadline for those wishing to extend is November 15, 2018. Please indicate on your application your preferred dates. Current Brothers and Alumni up to 26 are eligible for the program. Morning Educational Sessions with top Jewish thinkers on a variety of interesting, current, and personally relevant topics like, What Difference Does G-d Make?, Practical Spirituality, Jewish Lessons From The Far East, The Jewish View On Relationships, Leadership, Self Development, and many more. Aish is known for creating a dynamic, open, Socratic environment built on trust and respect for everyone’s opinions and comments. After this trip you will know more about Judaism than you could have ever imagined! Exciting Afternoon Excursions to Train With IDF Counter Terrorism Experts With Live Fire Training, Fill Boxes for Needy Families, Restore An Ancient Synagogue, Plant Biblical Fruit Trees, Hike, and much more. Will I Have Time To See Family And Friends? Yes, we can always work together to accommodate visits for family and friends. After the schedule is distributed we can figure out how to find the right times. Is it really just $600 for everything? Yes! You pay $600 and it includes everything. The trip is highly subsidized. We do ask that if you have a Federation, Hillel, or other source of potential funding that you reach out to help defray the actual costs, as well. Actual trip costs are between $4,000 – $5,000 per person. Details will be discussed in the interview. Interviews are either in person or via video chat. They typically last 15 – 20 minutes and discuss all aspects and expectations for the trip. They also serve as an initial getting to know you session for the participant and the trip leaders. Is applying for the trip a commitment to go on the trip? No, but it gets the ball rolling and makes it easier to get you on the trip when you decide to participate. 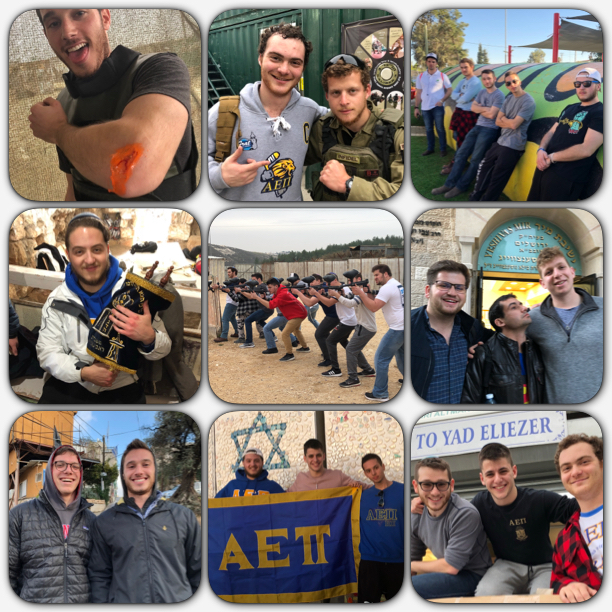 This trip is for AEPi brothers that want to deepen their connection to Judaism, Israel, the AEPi brotherhood, and to have an amazing time while doing it. If that’s you, then sign up and let’s go!